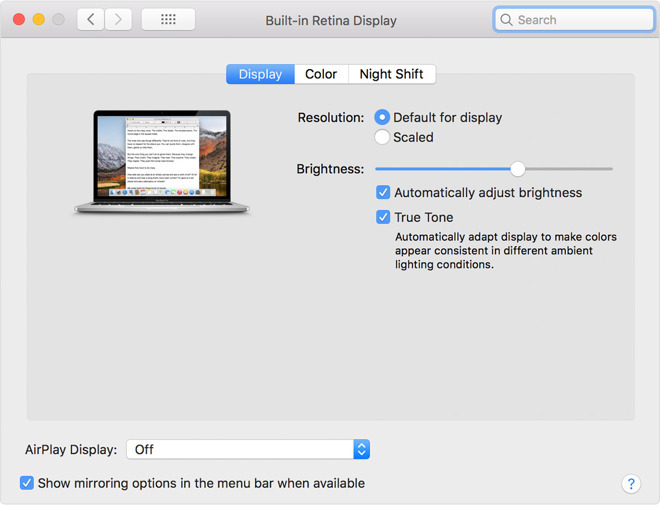 Apple has detailed True Tone features in the 2018 MacBook Pro, with some surprising displays on a list of compatible monitors. In the support document published on Friday, Apple has noted that the 2018 MacBook Pro includes True Tone technology on the internal display. Additionally Apple's last display, the Thunderbolt Display from 2011 can do it as well, when connected with Apple's Thunderbolt 3 to Thunderbolt 2 adapter. Enabling it is a simple checkbox. The system will adjust all the compatible displays accordingly, and automatically. At present, it isn't clear if the feature works when the computer is in "clamshell" mode. First introduced in the Apple ecosystem with the 9.7-inch iPad Pro, True Tone is Apple's system for keeping the white balance of the display the same in appearance to the user, regardless of the ambient light around the screen. When the device is moved from one environment to another, the screen is perceived by the user to be the "same" at all times. Normally when the ambient light in an environment changes, the screen's white balance and general coloring appears to change, such as becoming more blue or orange, even if the display's settings are kept the same. This is actually a problem caused by the user's own vision, due to observing the change in the rest of the environment's lighting conditions and adapting to that, while also noting the "changed" display. True Tone combats the issue by using four-channel sensors to detect the ambient light that can affect the perception of the display. 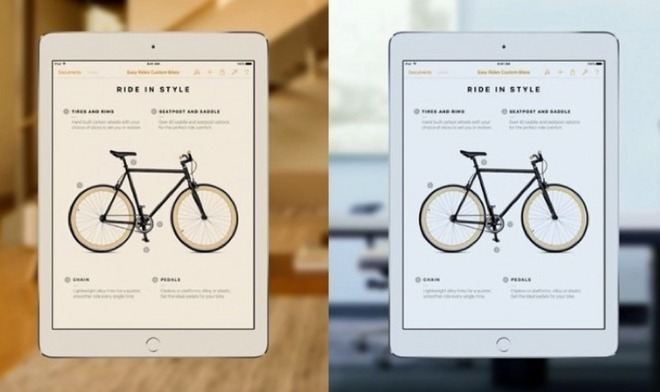 If a change is detected, such as the user moving an iPad Pro from a room lit with cool blue-ish lightbulbs to the more-yellow light outside on a sunny day, the screen automatically alters what it displays to match, in turn keeping the screen comparably similar despite the differing light situations. Presumably, either the Thunderbolt connection, or the USB 3.1 type C connector provides additional information to the display to allow for these changes, that HDMI or DisplayPort do not. Developed in partnership with Apple, the LG UltraFine 4K Display, and its larger 5K sibling, debuted as a surprise accompaniment to the redesigned MacBook Pro lineup at a special media event in October 2016. The standalone displays serve as a replacement for Apple's Thunderbolt Display, which ceased production in June 2016. Like the Apple-branded monitor, LG's UltraFine 4K Display acts as a breakout dock for port-limited notebooks like the MacBook Pro without Touch Bar models that come with only two Thunderbolt 3 ports. The better equipped, and more expensive, MacBook Pro with Touch Bar models sport four Thunderbolt 3 ports, but still lack USB-A inputs —a source of much discontent amongst a vocal contingent of the user base. The UltraFine 4K comes in at 21.5 inches on the diagonal with a resolution of 4,096-by-2,304 and P3 wide color gamut support. On the back are three USB-C ports limited to USB 2 specification speeds. The display's internal power supply is also capable of charging external devices, but is limited to 60W over Thunderbolt 3. LG's UltraFine 5K Display measures 27 inches and supports resolutions up to 5,120-by-2,880 with P3 color. The display boasts three USB 3.1 ports on the back for attaching high-speed accessories, and also includes stereo speakers, a microphone and front-facing camera. An uprated power supply produces enough juice for 85W of charging power over Thunderbolt 3. At launch, some UltraFine 5K displays had issues with insufficient RF shielding, but this has been rectified since.